In an utopian world, things change for the better from top to bottom, from the legislative and executive, with the implementation and the applicability of laws. We often hear aphorisms like “Be the change you want to see in the word”. However, without a background or a starting point, this is another demagogic cliché, meant to set us on a moral high-ground. The youth exchange I am about to present provided the necessary tools, exercises and methodologies to make us aware of our active role in society as individuals, and collectively. We found out what we can actually do, and the means to achieve a goal. 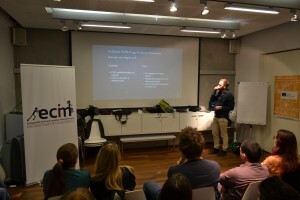 The project in cause is called OMACH (Open-minded + Active + Creative = Hired) and was held in Warsaw, during 12-20 of March, 2016. 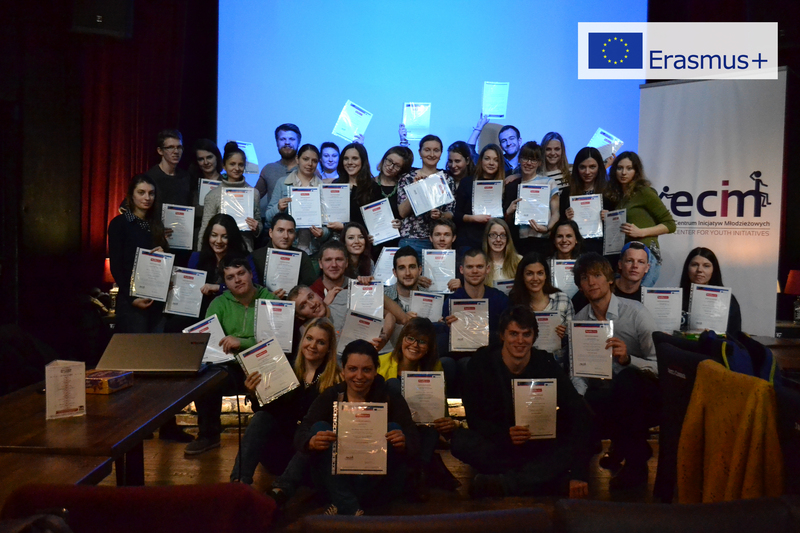 Funded by Erasmus +, OMACH is the first Youth Exchange of European Center for Youth Initiatives organisation. The first of many to come, hopefully. When it comes to youth exchanges, there is a wide range in the spectrum of opinions. As Euroscepticism unfolds over underestimated concepts as non-formal, intercultural, interactive learning, communication and cooperation, the significance and importance of good programmes are not yet unanimously accepted. Truth be told, there are youth exchanges like this one that have a much more positive impact on the long run than some people might suspect. We were 35 participants from Poland, Latvia, Croatia, Hungary and Romania, and the group leaders for each country. The active nightlife of Warsaw and overall temptations could have been alluring. However, due to the power of example in terms of professionalism, perfectionism and kindness of the project’s coordinator, we did not overlook our main purpose, and we managed to be on time and focused on the activities; most of the time. The project had a holistic approach, according to the problems addressed: being more active youngsters in the society, youth unemployment, intercultural learning, social entrepreneurship, transposing the creative thinking to another level. Experiential learning, process-oriented learning, interactive theatre, snowball effect, problem tree are some of the few methodologies used in our exercises. We were pleased to discover that our possibilities related to active citizenship are bigger than we initially thought. Furthermore, it is everyone’s responsibility to go home with the know-how and apply what we learnt. Despite our tendency to form coteries and to stay in our comfort zone bubble, we were asked to form mixed groups, randomly. This might be one of the best outcome of the project, since we made creative brainstorming beyond our barriers. We wrote projects in trans-national groups and we found similar problems in more countries: passive youngsters, youth unemployment, social issues of all kind, and means to solve them. 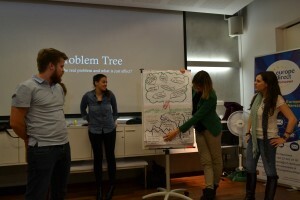 During social entrepreneurship presentations in different states, we were provided with the whole picture of certain problems, the action plan, and the evaluation. related to start-ups and personal projects. Another highlight of the week was, perhaps, Lip Dub. For most of us this was a premiere, and we had to put in scene the whole concept from the beginning. Due to the good guidance of the coordinators, the outcome was spectacular, and the means to achieve it, in terms of team bonding, trial and error, time frame and boosting creativity, was really entertaining. Every daring idea was accepted (even rolling a barrel indoors, climbing on the bar) for the sake of art, or as an encouragement to think and act outside the box. A week of diverse activities flew away in a blink, and that was the general perception of all participants, towards time, as the second coordinator prevented us from the beginning, advising us to make the best of this experience. The fast-paced rhythm combined different topics and methodologies in a homogenous unity, meant to consolidate our knowledge and clarify specific aspects. The coordinators were more than facilitators, they acted as mentors, and each detail was perfectly organized: logistics, accommodation, food. The daily schedule perfectly combined learning, discovering, reflexion, energizers, enjoying our time. Cultural evenings were likewise memorable, conveying a mix of solemnity, interesting facts, dances, joy, and great fun, especially when we were trying to pronounce Polish words. Some things truly represent the token of their origin place: Slivovitz, Unicum, Țuică. As it happens, sometimes you get to stay one week in a city without fully understanding and visiting the place, since you fall into the trap of sense of time and location, following the same route to the main attractions. In this case, we had a cognitive tour of the city presented by a local guide. We understood the charm of the place even more during our city game, where we had to discover a location, to ask locals the tale of the monument in cause (the mermaid, the duck, the Basilisc, and the bear) and to make a video about the legend. We were surprised that some people didn’t know the story, and we felt even more privileged when we discovered it. However, the cherry on top in terms of exploring Warsaw might be the moment when we had a bird’s-eye view upon the city, from the Palace of Culture. The initial fog made room for clear skies, to unravel a modern, Legoland city with intriguing personality. To sum up, in non-technical fields as humanities, and the more so in complex realities related to social entrepreneurship, start-ups, project ideas, it is a great challenge to leave aside the Mumbo-jumbo, and to deliver transferable skills, competences, knowledge, a change in attitudes. 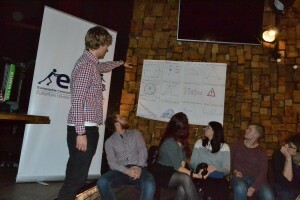 However, the coordinator of the project successfully did that. At the end of this youth exchange, apart from being a beautiful, enriching, inspiring experience, I can honestly say I’ve came up with new ideas, I‘ve learnt and practiced specific skills, and most important, I’ve discovered more of the inner and outer world. Our partner for this project is Campus Warsaw. Thanks to them, 40 young people had the possibility to visit Campus and talk with its representatives about opportunities that are created for young entrepreneurs. Visit was one of the great results of the project, that inspired and motivated participants for further stimulation of creative thinking as well as taking open and active attitudes.